The Royal Flying Corps (RFC) is a formation not normally associated with campaigns outside of the Western Front, however this image shows men from the RFC in a very famous setting in early 1916. One of the main squadrons operating in Egypt at this time was 14 Squadron, and these men well be from them. They were based at a number of locations around the Suez Canal from 1915, keeping an eye on the Turks in Palestine and tribes in the Western Desert; towards the end of 1916 this involved in assisting T.E. Lawrence: ‘Lawrence of Arabia’. The RFC men in the photo are wearing the familiar ‘Maternity Jacket‘ uniform which must have been fairly warm in desert conditions and possibly means they had not been ‘in theatre’ that long. I once interviewed a WW1 veteran who said that this location was the most popular place to have your photo taken in Egypt, with the backdrop of the Sphinx and Pyramids. The cost of the photo was relatively cheap and soldiers would be queuing up to have them done; a little board was placed in front of the camels with a number on (visible in this photo) and you then came back, quoted the number, and got your postcards to send home. I have since interviewed men who served in Egypt in WW2 and post-war and it seems little changed over 50-odd years! 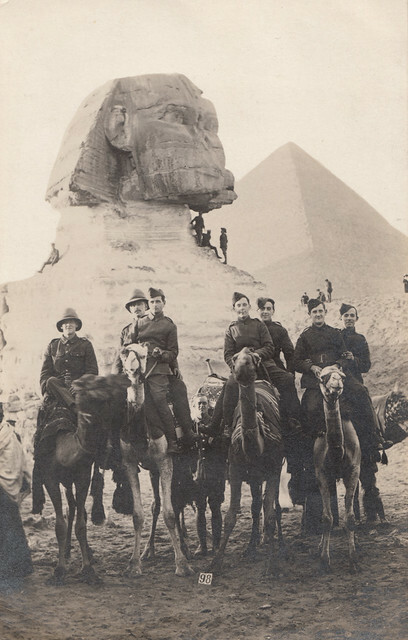 A nice touch in the photo is that just below the chin of the Sphinx are some men of the Australian Imperial Force; Diggers whose iconic Slouch Hats are clearly visible. These could be from some of the AIF units then assembling in Egypt or some veterans just back from Gallipoli. Many of the famous Ancient Egyptian structures seen here are still covered in graffiti from this period. This entry was posted on 10/02/2012 by sommecourt. It was filed under Egypt, Gallipoli, Great War, Royal Flying Corps, WW1 and was tagged with 1916, Airmen, Egypt, Pyramids, RFC, Sphinx, WW1. The records of the RFC are held by the National Archives in theUK. These records are not online yet, so it means a visit. Would like to visit the National Archives but only if there was data on RFC over the Somme and Egypt where my dad Lt W S V Oliver served. I would like to find out where he did his formal training! My great grandfather was a member of the balloon unit and I have his diary with dates and places he visited on the way back and from Egypt 1917 and 1918. I wonder if he is in any of the photos? would be great to have a look if possible? Thanks for your entry ref your grandfather in WWi in Egypt. See my entry below. Would love to share my fathers data with you. Dear Fred I fould you post today and was very interested in the photos you have of the RFC in Egypt. I am a member of Cross & Cockade the Society of World War One Aero historians which was formed in the UK in 1969 and is a world wide group dedicated to researching and publishing details of the RF/RNAS during the Great War in its quarterly Journal. Hi Martin – my grandfather, W H Oliver, did his pilot training with 66TS in Egypt in late 1917. Would this be the same outfit your father trained with? Thanks Geoff. Quite possibly. My dad was with 193,194,23 Reserve Squadron,144 and 113 Squadrons at Abukir. My Tel No is 01202 888594. Keep in touch. Martin. I ama member of Cross & Cockade International, the society of World War One Aero Historians which was formed in the UK in 1969, We research all aspects of war in the air 1914-1918 in our spare time and produce a high quality quarterly Journal paid for by subscription. Over the last 40 years I have been researching the RFC/RNASin the side shows and I am currently working on a history of RFC training in Egypt 1916-1919, hence my interest in your post. Looking through my extensive records I find that I h ave the following details which I hope matches up with your fathers details. Qual as pilot 20/4/18 To 144 Sqn Palestine then 113 Sqn returned to the UK10/1/1919. I do not have your fathers full name, if you can supply that, also I’d be interested in a copy of his flying log book(if you have it) and also details of any photos you have that I might be able to have copies of. I have just got onto this site by accident after doing some research on my grandfather George Edwin Tiltman who was a sergeant Engineer in the RFC Egypt 1916 and later Serbia. I have loads of photos and other things and also a strange medal which we wanted to identify.I would like some contact details to send these on if anyone was interested. My Father, Norman harry Taplin joined the RFC from service in the RHA. He was posted to Egypt and gained his wings. I believe he flew SE5A’s but have little info. I think he was involved with Lawrence because he continued contact in Southampton until Lawrence’s untimely road accident at Clouds hill. They both rode Brough Superior SS100 ‘s. My Father gave me Lawrence as a middle name. I would be very pleased to know more about my Father’s RFC service.